There are grooves (Swedish: sliprännor, slipskåror) carved into rock in many places in Europe, and some of them appear on the Baltic Sea island of Gotland. They are common in France, where they were used to polish stone axes. 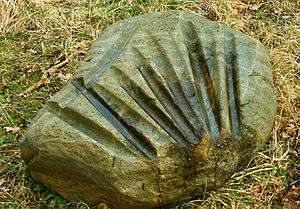 Grooves in France date from the Neolithic and are called polissoirs. Those in l’Aube date from c. 2500 to 2000 BCE. People who built dolmens, erected menhirs and made grooves supported an archaeological culture known as Seine-Oise-Marne. The l’Aube district had more than 130 monuments from this period including 49 grooves before 1927. Today there are only 34 including 16 grooves. Many stones were cut into roadstones or building blocks for homes. 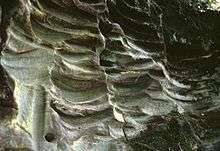 Neolithic Grooves have been found in Tamilnadu, India. 3,600 grooves have been discovered on Gotland, of which 700 are in limestone outcrops, while the remainder are on c. 800 boulders and slabs. The grooves are 50–100 cm (20–39 in) long, c. 10 cm (3.9 in) deep and c. 10 cm (3.9 in)wide. The grooves have apparently been made with an abrasive pendulum measuring c. 192–283 cm (76–111 in) in length. Certain late 1st-millennium picture stones on Gotland carry grooves that have been made after the relief of the stones was carved, which show the grooves to be late. Likewise with the level above current sea surface of the lowest grooved outcrops on the island, that shows them to be no older than AD 1000 judging from post-glacial shoreline displacement. It has been suggested that on one picture stone, part of the Late Iron Age decoration is carved into the bottom of a groove, meaning that this groove must be older than the picture. ↑ Mårtensson, Torsten. "Sliprännornas praktiska bruk" (PDF). Fornvännen. ↑ Gannholm, Sören (1993). "Gotlands slipskåror" [The Gotlandic grinding grooves – Stone age calendars?]. Sören Gannholm. ISBN 91-630-1845-4. 1 2 Henriksson, Göran (1983). "Astronomisk tolkning av slipskåror på Gotland" (PDF). Fornvännen. Royal Swedish Academy of Letters, History and Antiquities. ↑ Henriksson, Göran (2000). "The grooves on the island of Gotland in the Baltic sea: a neolithic lunar calendar". In Potemkina, T.; Obridko, V. Paper presented at "Astronomy of Ancient Civilizations", 8th SEAC Conference, Institute of Archaeology, Russian Academy of Sciences (PDF). Moscow. ISBN 5-02-008768-8. ↑ Swanström, Lennart (1995). "Slipskåror och järnhantering på Gotland". Gotländskt arkiv. Visby (67): 11–18. ↑ Lindström, Jonathan (1997). "Fornlämningarnas orientering på Gotland: en kritisk granskning av den arkeoastronomiska tolkningen av slipskåror samt en studie av riktningsfördelningen hos öns forntida gravar, hus och medeltida kyrkor". In Janzon, Gunborg O.; Åkerlund, Agneta. Till Gunborg: arkeologiska samtal. SAR : Stockholm archaeological reports, 1101-3087 ; 33. Stockholm: Dept of Archaeology, Stockholm University. pp. 497–508. ISBN 91-630-6053-1. LIBRIS 7452427. ↑ Munthe, Henr (1933). "Om Gotlands s.k. Svärdslipningsstenar". YMER. Stockholm: Svenska sällskapet för antropologi och geografi. pp. H. 2–3. LIBRIS 8258525. ↑ Henriksson, Göran (1988). "Nya undersökningar av bildstenen från Othemars i Othem". Gotländskt Arkiv.